We've made it even easier for you to put on a great display by providing everything you need in one giant box! Our Platinum firework box is a fantastic selection of larger, bigger effect fireworks for a perfect bonfire night fireworks display. 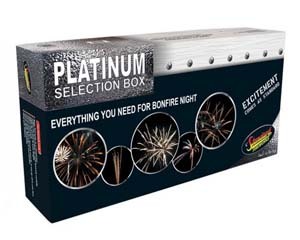 The Platinum fireworks selection box contains 32 fireworks including; 5 Fountains, 4 Roman Candles, 2 Shot Tubes, 13 Roman Candle Cakes, 2 Mines, 1 Wheel, 4 Rockets and 5 sparklers. The recommended viewing distance for spectators for this display is 25m. The fuses are created for each firework based on their category and recommended viewing distance. Always ignite the firework at arm's length and then retreat to a safe distance as swiftly as possible. The Platinum Fireworks Selection Box contains a collection of the items. Each item will be needed to be lit separately, unlike a single ignition firework cake. The advantage of a selection box means you can light them consecutively for a shorter powerful display or spread out the display individually over a longer period of time or over the course of an evening. This selection of fireworks is suitable for all kinds of occasions including Bonfire Night, New Year, Chinese New Year, Diwali, Hogmanay, weddings and birthdays and parties.